The winter is still young, so it is a great time of the season to make sure that we are blocking out the cold air and sealing in the warm air of our homes. 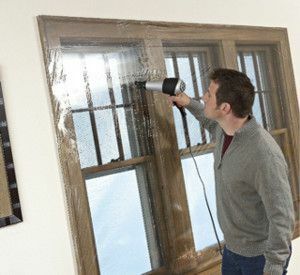 This can be done through many means, but one of the most popular and most cost-efficient methods is by insulating drafty, poorly-sealed windows with clear film, such as 3M’s window insulator kits. These kits include a crystal clear film and Scotch brand double sided mounting tape. To install, you want to make sure that your window (or door) frame is clean and dry. Apply the tape and adhere the film. Then use a hairdryer to shrink the film tight and to remove any wrinkles… it’s that simple. In as little as 15 minutes you can have your window(s) sealed with 3M’s insulation and you are set for the winter! Not only are their cost savings with sealing these leaky windows, the rooms will also be remarkably warmer and more comfortable to use! If you are curious just how much you can save by insulating some of your windows, 3M has an exciting savings calculator on their website to use. Typical savings are about $10 – 25 per window that is sealed, so it can really start to add up if you have a bunch! If you are interested in learning about some of the other methods for reducing your heating bills this winter, please reference our Blog article from last year (Spend a Little – Save a Lot: Do-it Yourself Tips for Lowering Your Heating Bill). Here’s to staying warm and cozy this winter! Thanks for reading! !